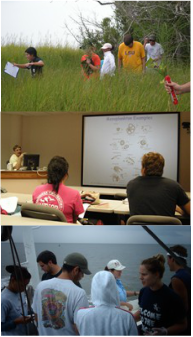 Dr. Roberts currently teaches three courses at LUMCON: 1) Changing Coastal Oceans which is offered every spring semester; and 2) Marine Field Ecology (offered in even years) and 3) Coastal Biogeochemistry (offered in odd years) as part of the LUMCON Summer Program. Descriptions of each course are included below. CCO is team taught by members of the LUMCON faculty each spring semester. Course Description: Coastal oceans are among the most valuable and heavily impacted environments on earth. Human activities such as commercial and recreational fishing, water management, mariculture, land development, shipping, and mineral exploitation have significant ecological effects on coastal environments. In addition, human activities that occur far inland affect coastal oceans through runoff and atmospheric deposition. In this course, faculty of the LUMCON will present a series of lectures on the effects of human activities on the chemistry, biology, ecology and ecosystem structure and function within coastal marine environments. Topics describing recent changes in the coastal ocean and addressing their implications include: pollution, climate change, habitual change, hypoxia, harmful algal blooms, coral reefs, coastal fisheries, coastal zone management, and others. The course includes one weekend field trip to the DeFelice Marine Center in Cocodrie, where the instructors will use the local coastal environment to illustrate topics that have been discussed in lectures. Dr. Roberts gives several lectures in the course including on ones on primary production, respiration, nutrient cycling, euthrophication, pollution, and climate change and participates in the course field trip. Course Description: Marine Field Ecology is a field intensive 4 credit course that provides a combination of lecture and field experiences in marine ecology. Topics covered include: relationships of marine and estuarine organisms to environmental factors; interactions among organisms; ecological processes of energy and materials flow; community and ecosystem ecology with a particular focus on the Louisiana coastal zone. Course Logistics: This course meets all day, 5 days a week for 4 weeks. A typical day consists of two, 75 minute lectures (with a break in between) in the morning followed by an afternoon field and/or laboratory activity. 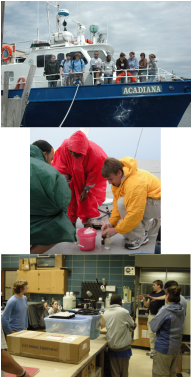 Examples of field activities include a sampling trip on the R/V Acadiana (water sampling, light readings, collection of phytoplankton samples, and shrimp trawls at multiple locations in Terrebonne Bay), mark-recapture studies, ecosystem metabolism measurements, water sampling for nutrient analyses, physiological studies, phytoplankton and zooplankton sampling and sample examination, benthos sampling, diversity studies, marsh elevation gradient sampling, examination of the influence of the marsh edge on communities, sampling of high vs. low energy environments, among other activities. Dr. Roberts has served as the Director of the LUMCON Research Experiences for Undergraduates (REU) Site Program since it began in 2011. Details on the program can be found at the Program website [link]. The Roberts lab has mentored undergraduate students on independent research projects each summer since 2009. Abstracts for the projects completed by REU interns since the initiation of the NSF-funded REU Site Program in summer 2011 can be found by clicking on the name of the REU intern.